The University of Sheffield will be part of a pioneering £5m project which aims to transform the process of turning research into businesses across the North of England. 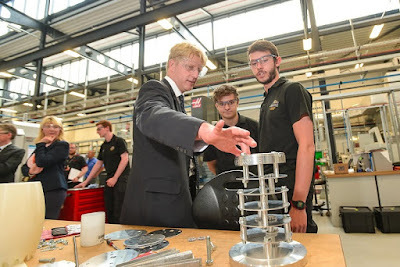 Announced this week by the Universities Minister, Jo Johnson (pictured in Rotherham in 2015), the funding will see Sheffield work with the Universities of Manchester and Leeds to develop a Northern Triangle Initiative (NTI). The NTI will support the growth of a significantly enhanced, shared intellectual property pipeline, set up a unique regionally-focussed finance vehicle, seek to raise £350min private finance to support university commercialisation, and strengthen the entrepreneurial eco-system of the North of England. In particular, the award will allow the partners to collaborate in developing intellectual property projects into business propositions in areas of common strength such as advanced materials, medical technologies and computer science. The partnership between academia and industry is nowhere stronger than the University of Sheffield Advanced Manufacturing Research Centre (AMRC) with Boeing and the Nuclear AMRC, which both have significant state of the art facilities on the Advanced Manufacturing Park (AMP) in Rotherham. The centre attracts paid industry members at different tiers, keen to make use of the world-class machines and facilities at the AMRC. The model also enables the centre to secure European and Government funding for a diverse range of cutting edge technologies, from shaped metal deposition in the aerospace industry to the use of bio-composites in the automotive industry. Professor John Derrick, Deputy Pro-Vice-Chancellor for Research and Innovation at the University of Sheffield, said: "The funding for the Northern Triangle Initiative lays the foundations for new advanced science and innovative industry collaborations that will help to deliver real change and create economic growth not only for the north but the whole of the UK. "At Sheffield we are immensely proud of our longstanding research-industry links - particularly in advanced manufacturing - and we are looking forward to working with our partner institutions on this inspiring initiative and extend these even further to bridge the gap between the outstanding research undertaken in universities and industry." The funding forms part of an allocation of £20m to winners of the Higher Education Funding Council for England (HEFCE) Connecting Capability Fund competition and forms part of the Government's Industrial Strategy green paper. The fund supports universities in working together and with external partners to commercialise research, help deliver the strategy and share good practice and capacity. Lasting for three years, the immediate aims of the project are to work with investors and entrepreneurs to form a dynamic support system and initiate and develop some 75 technology transfer projects across the three partner universities.